This screened feeder is designed for black oil sunflower. 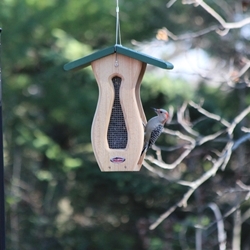 Woodpeckers, chickadees, nuthatches, & titmice are a few of the birds that will cling to the sides of a screen feeder. There is very little waste because one seed is pulled at a time through the mesh. Solid cedar and stainless steel screw construction. Four sided feeding. Durable heavy gauge screen. Hinged roofs. Easy to mount from the bottom or ready to hang with included cable. Holds 15 cups of seed.